I’ve completed your assignment, Professor Reich. I’m not a “Republican running for office next November” and regarding “thinking hard about things”, well, unless I’m missing something, I just don’t see where this is so hard. Perhaps I need some after-class help. You seem to share Paul Krugman’s never-ending chorus that government must step in and make up the difference when private sector spending undergoes a contraction. Here’s a good example of that. I admire your consistency. And you said that on live TV, to boot! I suspect that you have fond memories of your time on the playground, creating wonderful towers of sand with a sand digger, standing back and announcing “Look, everyone, at what I’ve made! Isn’t it grand?” But I also suspect that you ignored all of the cries of the other kids in the sandbox: “Hey, Bobby’s taking all the sand again! Jimmy just broke his ankle in a hole that Bobby made! Bobby’s hitting dirt and wrecking all the sand!” How did you get all this past the playgound aides? I’ll stay after class for extra help if you can provide an explanation of how increasing government spending, massive deficit spending no-less, which must be funded with the resources taken from the private sector, ultimately helps the private sector. I mean, on one hand, there seems to be nearly uniform agreement that we want the private sector to create jobs. But on the other hand, aren’t you advocating taking the resources with which, at the margin, the private sector will create those jobs? I’ve heard something about a “Keynesian Multiplier”, but what about what I’ll call a “Government Subtractor”? (and can I get extra credit for that term?) It seems to me that if the federal government decides to spend a bunch of money, it needs to first spend some of that money deciding how it’s going to be spent, and then if it passes it on to the states, the state governments are going to do the same. Maybe even a local government will get involved, too. So how much of each original dollar, taken from the private sector in the first place, actually returns to some recipient in the private sector? In addition to that, how do you feel about everyone arguing via politics on how to spend all that money? Are the playground aides still involved here somewhere? For another twist on that theme, you must be familiar with organizations like Charity Navigator that rate various charities at their efficiency. No one likes to give to a charity that wastes tons of money on administrative overhead. I suspect the government would not rate very highly if judged this way. Again, I’m no Keynesian, but if we just did an across the board tax cut, one that could be largely achieved just by changing a few variables in some software here and there (I learned that in my programming class), wouldn’t that basically pin the charity evaluator’s efficiency meter? It would put more money in everyone’s pockets overnight, where they could do whatever they thought was best with it. Yes, admittedly, it might not make for many great photo ops, like you sitting on the digger next to your nifty sand castle. But what really has me stumped is how you are smart enough to decide that the private sector is not spending enough, and can decide (even approximately) how much the government should spend instead. In other words, you not only feel confident in identifying a gap between the actual and the ideal, you’re prepared to use the force of government to do something about it. It must be the leverage of that sand digger you that remember. The power in those two handles really is pretty cool, I confess. 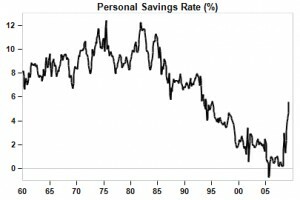 I know that a lot of people used to bemoan the United States’ very low saving rate. But it sure seems to me that they got the message recently! Looks like they’re saving again! Have you decided that this huge collective behavior of our society is actually wrong? Are you pitting your singular professorial prowess against the collective brainpower of all of these new-found savers? It seems to me that the only way you’d feel comfortable saying that the government should spend more is if you believe that the government will spend the money more effectively. I thought we were in Econ 101 here… is this some preview of a graduate-level course or something? Do you teach that course, too? I will hand it to you though, all these different spending programs over the years have certainly created a very impressive tower of laws and regulations, along with an army of individuals trying to figure them all out. It seems a lot of politicians loved their sand diggers, too. But they must have mixed mortar into the sand they used for those towers, because no matter how hard people jump up and down on them, they never seem to collapse. This was such a well articulated article, thank you for your time in putting it together and sharing it with everyone. There’s no argument here — just name-calling and emoting. When the government spends tax money, it spends it…in the private sector (smile) It gives business to private companies, which has the effect of helping the private sector which is in recession. Government welfare payments, unemployment payments, Medicare, Medicaid, all the New Deal, Great Society programs have the same effect. A poor person spends their welfare money in the PRIVATE SECTOR. So, welfare payments help the private sector recover. From where does the government get the money it spends in the private sector? But I’d also love to learn from you where the money for public-sector employees comes from. And Charles, if you’re being facetious here — great — but unfortunately about half of this country won’t notice (frown). I’m not 100% certain I agree with this, but I think you’ve got a quality discussion started and you’ve definitely given me something to debate. The money the federal government spends does not come from the private economy as you say again and again. Most of it is borrowed from overseas or is printed. This money is spent by people and hopefully will stimulate the private economy. The stimulus was roughly in equal parts divided between a tax cut for working Americans, help for states so they would not cut public employment and infrastructure repair.That’s terrible? Hmmm…borrowed over sea’s. Yes true, but borrowed off the tax payers of the United States…AND AT A HUGE PERCENTAGE RATE…which most banks would be called out here in America. We “borrow” from China, Japan, Korea and even Russia. Printed? Yes, at a huge deflation rate on the dollar, which the FED (established under a Progressive) will run into the ground. Spent? Yes…mostly on stuff WE don’t make that WE really don’t need, because WE increased taxes so much WE sent manufacturers over sea’s….which I find it funny now that our government says their gonna fine (tax) and tax (tax) companies if they don’t come back….ignorance is bliss. The problem with your argument is, there’s no historical precedence to back it up. But an argument for government spending during a time of private retraction has plenty of historical precedent and proof of viability. You forget the last time we spent money on infrastructure (FDR), it resulted in the national highway system, which paved the way (literally) for plenty of corporate growth. Was the private sector going to make those roads? There are plenty of newsclips, articles, and stories of all the Senate and Governor detractors of the stim (a stim which was initiated by Bush, if you remember), taking their fat checks and posing for the cameras, crowing about the jobs they created in their district (but… by voting NO on the Obama stim). Your argument you only see expensive signs is disingenuous at best. Selective memory is not an excuse for bad politics. Try google. Taxation of corporations driving business away? Tired argument proven wrong, time and time again. Taxation did not drive manufacturing overseas. Greed did. The greed of the American public’s need to consume, but for roughly the same amount of money they spent back in the 70s. Think about it. In the 70s, you could buy a t-shirt on sale for $7. Nowadays, you can buy a t-shirt on sale, for $7. How can that be? That leads us to the the greed of the corporations themselves, who want to make more money, but spend less, doing it, finding ever cheaper, ever more exploitable work forces to keep up with the US demand for cheap products. “Lower taxes and bring manufacturing back to the US”…? Keep wishing. We all know trickle-down did not reward us with thankful corporations keeping jobs here to take advantage of the Reaganonmics. The Good-Old Reagan years are when the exodus really took full swing. Yes, Dems voted to allow this to happen as well, but take every policy that allowed corporations to do this, and a Republican initiated it. 1. Re-read the article. The main point is that no person or group of government officials is anywhere near smart enough to get this right. Hence, it is folly to try, and there’s “plenty of historical precedent” for bad unintended consequences. 2. “Greed” has nothing to do with it. If you have a problem with people wanting $7 T-shirts today, just exactly how would you make sure that people could NOT buy T-shirts for $7? Just what would you say to the customers at WalMart, Target, and wherever who freely and gladly buy T-shirts for $7, therefore leaving cash left over to buy something else? 3. Are the supposedly “greedy” corporations employing slave labor? If they are, I’d be the first to pronounce that as wrong. If on the other hand they’re creating jobs with employees joining voluntarily, raising global standards of living, lifting hundreds of millions of global citizens out of poverty through slow-but-steady wealth creation and thus CREATING POTENTIAL NEW MARKETS for our own exports, just what exactly is your problem with this? Again, propose a better system. 4. Ask the yacht-builders in the Northeast US about what happened when class-warfare legislation attempted to fight “trickle down economics” (ie, attempted to fight reality): Thousands of destroyed jobs, and plenty of egg on the faces of the all-knowing politicians. 5. Bush’s stimulus — agreed: every bit as misguided as Obama’s stimulus, just not quite as big and not as blatantly political (witness Nancy Pelosi saying that stimulus should be “quick and targeted”, and then passing a total pork-fest package with political handouts lasting an entire presidential term). Bill, do you have any idea what money actually is? Hint-it’s not the paper it’s printed on, nor the state-to-state transfer of credit. It is the physical marker of the time and energy invested-the work-of the individuals who justly hold it. The government only comes into real possession of this by taxing it or providing a service for a fee. Simply cranking up the presses or borrowing it does not create it-at some point, the government will have to come to you, and take some of your time and energy to pay back those who they borrowed from. And because this repayment will always be in the future, there will be interest to pay for the borrowed money-the taxed money will simply be inflated, because that’s what happens when you roll the presses before the time and energy is invested to actually create the money it represents. I guess you missed or failed Econ 101, Bill. You seem to not comprehend this. And, yes, it is terrible; theft of a peoples’ future time and energy always is-no matter how ‘good’ your intention is. Thanks for the superb blog – I loved reading it! I totally enjoy reading through this post. Good analysis. Very intresting information! Thanks! nice analysis, unfortunately reich is too stupid to understand even one sentence you wrote. Why do think Robert Reich works in Berkeley, CA? Where else could you be so consistently wrong and get paid for it?! Oh, that’s right, at the Center for American “Progress”. The unnecessary ad hominem attack says more about the author than it says about Robert Reich. With all due respect Mr Ball, your a loser. Seriously, who talks like that? He completely eviscerated that idiot Reich. He’s a meanie! He must be wrong, somehow, right? Mommy, wheres my blanky!! You seem unfamiliar with the term ‘ad hominem’; it does not apply to arguments that attack a person’s ideas, only those that attack the person-the ‘hominem’-rather than their ideas; and, despite this author’s gentle mocking of Mr. Reich, the far greater bulk of this post was directed to the derision-through-explanation of Mr. Reich’s ideas. I must admit that the explanation of Mr. Reich’s ideas usually does result in mockery, even amongst the most temperate of souls; explaining folly often does-spending time thinking such thoughts can make one quite short. As is evident in Mr. Reich. Now, that’s ad hominem. Marvelous! So often I read Robert Reich or see him on television and want to scream at the simplistic ideas he espouses. Thanks!